SYNOPSIS: This disc is a real time capsule and a Must-Have!
" A 60 min staged shoutfest over whether or not slasher flicks are bad for kids is one of our favorites. Rick Sullivan attempts to put the inimitable Morton Downey Jr. in his place until airhead "Fag-oria" editor Tony Timpone blows it by idiotically mouthing off and making all gorehounds look like dorks. Broadcast in the N.Y. area on June 16, 1989." Live at The Dive! : The second half of the disc is two extremely rare videotaped Q&A sessions. 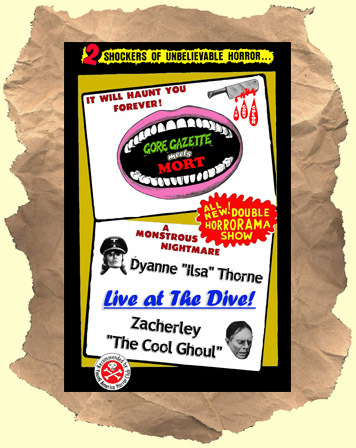 They were filmed at the infamous Gore Gazette's film screenings at "The Dive" in NYC circa 1980's. First up is everyone's favorite big-boobed blonde Nazi - Dyanne Thorne aka Ilsa: She Wolf of the S.S. She graciously answers questions from a rowdy crowd. It was filmed on the final night of the GG film series shot on June 6th, 1986 (30mins). And last but not least we have John Zacherley "The Cool Ghoul", one of the most beloved horror hosts of all time, entertaining the crowd with his "deadpan" humor in 1985 (30mins) . PLEASE NOTE: Both of the 'Live at the Dive' interview segments are first generation copies (so the image and sound are not degraded) but keep in mind are amateur-shot and not perfect.